Matt Miller creator of Ditch that Textbook released a post called 50 people and hashtags you MUST check out on twitter. This list is full of great educational twitters and hashtags! I was able to find three wonderful twitter accounts and one hashtag that really stood out to me. One of the Twitter accounts I found was @JoyKirr Ms. Kirr is a English Language Arts teacher who teaches 7th grade. Her account is full of great resources! One resource I found on her account that I really liked was a post from her blog. 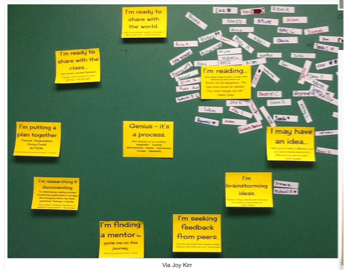 This post was about the Process for Genius Hour. This post had so many different examples of how to help guide students through Genius Hour while still allowing them to be independent. One example she used was having sticky notes up that dictate the different stages the students may be at and then allowing the students to put a sticky note with their name near the stage they are currently at. @ShakeUpLearning was another Twitter account I really liked. This account is ran by Kasey Bell a Teacher from Texas. She shares so many helpful resources all the time! 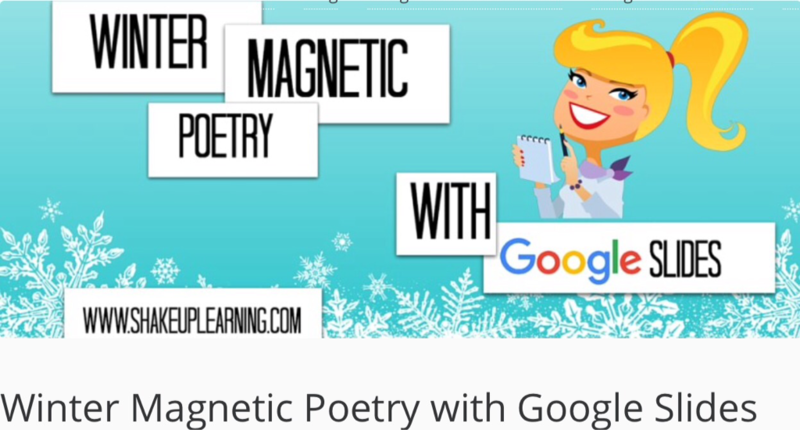 One resource I really liked that she created is Winter Magnetic Poetry with Google Slides. I had never seen Google Slides used for an activity like this before, but it seems great! The resource helps guide students when creating poetry out of winter themed words. It allows students to be creative while going over vocabulary words. This resource was located on Ms. Bell's blog Shake Up Learning, her blog is also filled with so many other great resources! @HeckAwesome is another twitter account that I really liked. Carrie Baughcum a special education teacher runs this account. She shares a ton of helpful resources on it. Not only does she tweet her own helpful resources like her great sketch notes. She also re-tweets other educators resources! 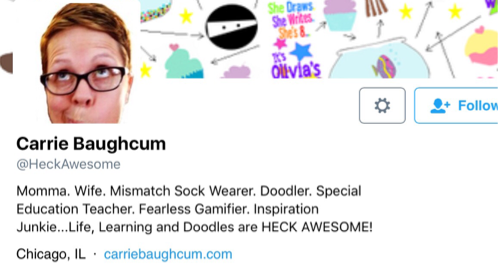 Ms. Baughcum recently re-tweeted @alicekeeler's tweet about adding Bitmojis to students Google Docs. This tweet talked about how to add in Bitmojis on to students Google Docs as a form of feedback. I just recently made a Bitmoji and I think this is such a fun and creative way to give students feedback! Another part of the 50 people and hashtags you MUST check out on twitter was a bunch of great hashtags for educators. I looked at #tlap which stands for Teach Like a Pirate. Educators use this hashtag to share resources and talk about the book Teach Like a Pirate by Dave Burgess. There were three resources that really stood out to me that I found using the #tlap hashtag. One of the resources I found was about how to design a lesson that lets students create Breakout games. It is called Student-Created Breakout EDU Games. I had never heard of this type of activity used within a classroom but after reading this post it seems like a great idea. This type of activity can cover so many different content areas at once while also incorporating creative thinking and problem solving. Another resource I found was an article from Matt Miller's website it was called Real change is slow. It’s discouraging. But it’s worth it. I found this article really helpful, it talked about the good and bad parts of being an educator. It tells the truth instead of sugar coating things while also still being motivating. One last resource I found was about Google Drive. This post was from Adam Schoenbart's blog, the post is titled Exploring Google Drive's Shared With Me: The Never Ending Battle. This post was about what you can and can not do when trying to organize and manage Google Docs/Slides. I learned a lot of interesting things while reading this. I did not know that you can not delete documents that have been shared with you, I have been wondering about how to do this lately. Thanks to this article I now know that I can't get rid of them. The #tlap has so many helpful resource it is a great hashtag to check out!